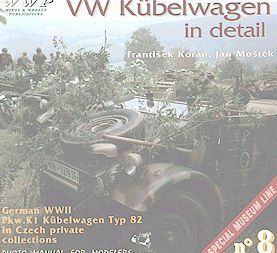 The book under review is the VW Kubelwagan in Detail, Special Museum Line No 8 published by WWP Prague, Contact RAK P.O Box 35, 170 06 Prague 7, Czech Republic. Authors are Frantisek Koran, and Jan Mostek, ISBN No is 80-802677-3-4. Published in their now familiar landscape format and on very high quality gloss paper, the book breaks down into the following chapters: Type 82 model 39, Type 82 model 43, Walk around, Exterior details, windshield details, Canvas top and frame, Engine details, Service accessories, Interior details, and accessories, Wheels, Small exterior details, Spare wheel details, Front axle details, Rear Axle details. Not a single part has been omitted and the attention to detail is outstanding, the quality of the photographs is very high. I thought I knew all the details of the Kubelwagan but I have learnt a great deal. I know that this book will find a lot of devotees in the modelling world. This book will be an invaluable aid in enhancing all the Kubel kits, which are now available and will form the basis for serious research into the differences of the models. One very pleasant surprise is the book is written only in English. Congratulations to the Editor and Author for taking the gamble and publishing in the International language of model makers and researchers. This book deserves a place on the reference shelves and will be used time and time again by those looking for inspiration for that little VW model. Price not known as the Editor Franti Koran sent a copy to me for review, many thanks and keep up the good work. Next in the series is going to be just as big the Steyr 1500 A1. I look forward to reviewing it.